Visit One of Our Daylighting Showrooms in Charlotte and the Triad! WHY CHOOSE NATURAL HOME LITE? Professional Installation requires NO construction mess! Produces Natural Interior Daylighting in dark rooms. No Heat, No Leaks, just beautiful natural daylight! 20-year Warranty – No glue laminates. VELUX SUN TUNNEL Skylights give you a choice for exterior appearance with the same great daylighting performance! Daylighting Professionals serving the Triad and Greater Charlotte Area since 2000 including the areas of Boone, Wilksboro, Hickory, Statesville, Mt. Airy, Burlington, Randelman, Asheboro, Lexington, Salisbury, Mocksville, Concord, Kannapolis, Mooresville, Harrisburg, Monroe, Lincolnton, Gastonia and the South Carolina counties of York, Lancaster, Union and Chester. Thousands of daylighting projects completed in Del Webb and Epcon Communities. I dealt with this company back 2008 and they did a wonderful job. It was a no brainer to use them again. Michael actually remembered me which was a good feeling. He came to my home to evaluate my situation and made several suggestions to try and accommodate my needs. 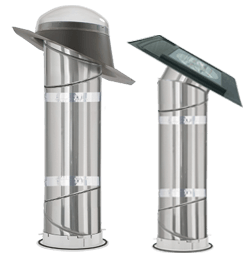 We decided two of the larger (tubular daylighting devices) would be best and the exact location would be determined when the technician arrived to install. Michael as in the past was very professional and honest. The quality of the product is supreme and the installation by his technician was excellent. I highly recommend Natural Home Lite. We had three providers to our home for quotes. We applied the Goldilocks theory: one was too high, one was too low–that one didn’t have insurance–and Natural Home Lite was just right. We contacted them in January. They responded, set up an appointment and actually were able to come by a day early. About three hours from their arrival it was done, no problems, no sweat. My family has some (tubular daylighting devices) in their house for years and every time I visit I comment on them. I decided to add one to our really dark bathroom and Natural Home Lite did a great job. I am so impressed how fast and the cleanup of the install. Excellent customer service, sales and install. Now our dark bathroom is no longer dark. I don’t even need to turn on the light during the day. This made a huge difference. I would recommend this product and company to anyone who needs a little more sunshine in your house. Natural Home Lite is an excellent company to do business with. The installation here was a challenging one and the installer was extremely skilled. He completed the installation in less than four hours with no problems whatsoever. Very professional. Worked to help me expedite my repair. Very Friendly & answered all questions to help me make an informed decision. Made every effort, going above & beyond, to make me a happy customer. They sell & install a quality product. Installer was courteous, cleaned up after, & did a very good job on the actual installation. Copyright 2016 Natural Home Lite.